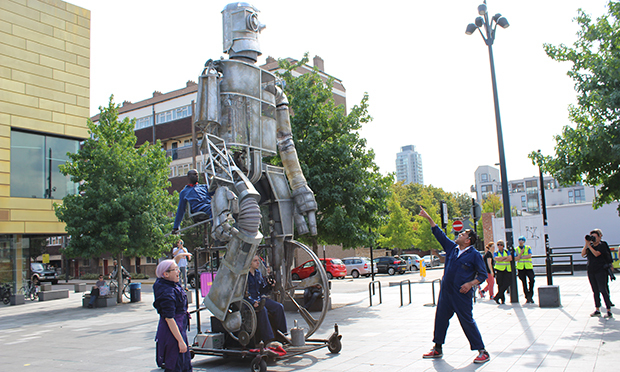 A Dalston theatre company delighted onlookers at the Mayor of London’s disability arts festival last week – performing interactive walkabouts with a 15-foot tall Iron Man puppet. Graeae Theatre, based on Kingsland Road, has a mission to “put D/deaf and disabled artists centre-stage” and has pioneered the inclusion of tools such as sign language and audio description in its productions. Part of the company’s vision is also to “explore new territory”, and their latest effort certainly attests to that. 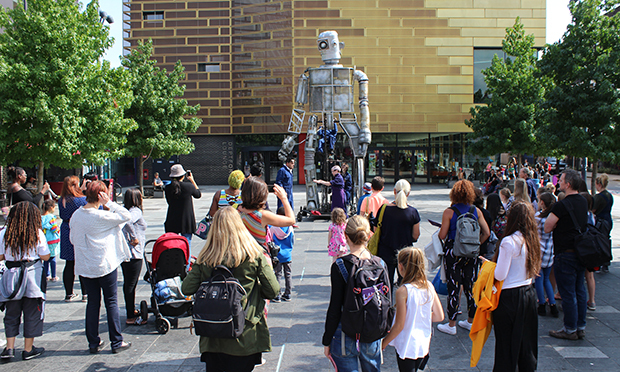 Inspired by Ted Hughes’ children’s book The Iron Man, Graeae dusted off its puppet, which is the size of a double-decker bus, for free walkabouts at the annual Liberty Festival. This year, under the new guise of Liberty Unbound, the festival took place across three different venues – in Enfield, Hounslow and Lewisham – for the very first time. It meant visitors had the chance to see the famous puppet make its first appearance in the capital for over five years. The walkabouts were accompanied by performers telling the story of the Iron Man, with integrated British Sign Language. Graeae also put on interactive workshops during which children made metal snacks to feed to the Iron Man. 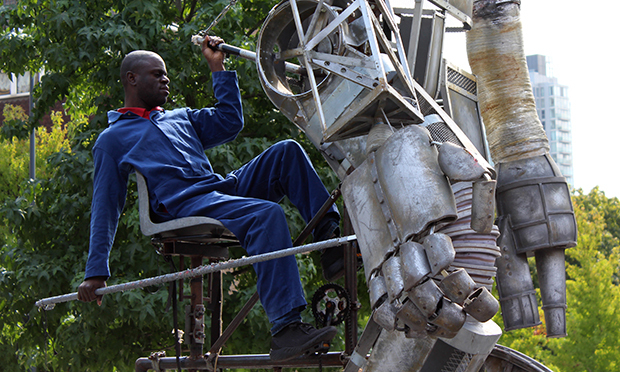 The man tasked with operating the giant puppet, Thom Jackson-Wood, said: “I’ve performed The Iron Man a number of times with Graeae and I’m really pleased that we were able to bring him back to London for the first time since 2013. Performer Aaron Virdee agreed, adding: “It has been an exciting, immerseful and exhilarating experience working on Graeae’s Iron Man‎ and to see the children’s faces glow throughout the performance is priceless. Fellow cast member Sami Thorpe said: “I love performing alongside this wonderful giant puppet. It’s a joy to see the smiles he brings to people’s faces as he moves along the streets. A spokesperson for Graeae said: “The Liberty Festival is a wonderful celebration of D/deaf and disabled artists across the city, and for its new 2018 guise as Liberty Unbound in different locations across London, Graeae’s Iron Man was delighted to come out of hibernation to entertain families in Deptford, Hounslow and Enfield. “Graeae’s mission to put D/deaf and disabled artists centre-stage aligns perfectly with the ethos of Liberty, and as such, The Iron Man walkabouts were performed with creative integration of British Sign Language. Since it was founded in 1980, Graeae has earned international acclaim for its pioneering work in creating accessible, world-class theatre productions. The company tours the globe, and won praise for its performance at the opening ceremony for the London 2012 Paralympic Games.